Something is very wrong with the bees. Since 2006, the mysterious phenomenon known as colony collapse disorder has wiped out countless honeybee colonies throughout Europe and North America, and nobody knows why. But a weird parasite may hold the answer. Honeybees are a natural target of a parasitic fly species called Apocephalus borealis. These tiny insects actually deposit their eggs in the bee's abdomen, and after seven days the newly hatched larvae push their way out of the bee through the space between the bee's head and thorax. This, of course, kills the bees. It's what happens between those two events that is capturing the attention of scientists. The bees, seemingly aware in some way of their impending doom, abandon their colony and fly around aimlessly, spending most of their time buzzing around the nearest bright lights. Researchers at San Francisco State who have observed this phenomenon say the bees simply walked around aimlessly, as though the parasites inside them had transformed them into the bee equivalent of zombies. According to researcher Andrew Core, that connection became particularly strong as the parasitized bees tried desperately to keep moving. Like a normal bee at the point of death, these bees would sit in one place and curl up in a ball. But the zombie bees kept trying to move despite their deathlike pose, repeatedly stretching out their legs and trying to stand up before falling down once again. Lead researcher John Hafnerik says he made the initial discovery by accident. Trying to find some some insects to feed a praying mantis in a completely different experiment. He went to some lights outside the biology building and collected a bunch of insects, including some bees. But then, he simply forgot about the insects and went off to work on some other project, which he admits fulfills every stereotype of the absent-minded professor. When he came back, most of the bees were dead and fly pupae were everywhere. He had discovered parasitized bees. This particular fly parasite has so far only been observed in beehives in California and South Dakota, but the potential is here to explain the bizarre mystery of colony collapse disorder. This parasite is a likely culprit because it does indeed force bees to abandon their colony, although the researchers aren't sure if that's the choice of the zombie bees or if they are thrown out by the healthy bees in the colony, perhaps spurred on by a chemical signal given off by the zombies. Viruses and fungi have often been put forward as explanations for colony collapse disorder, but this is the first time that parasites have been advanced as a serious possibility. There are still some huge questions left unanswered, though - particularly just where and how the flies are managed to inject their eggs into the bees. There's no evidence of the flies hanging around the hive, so the most likely explanation is that they fall upon the bees while they are out foraging. Still, Hafnerik concedes this is a "black hole" in their model, and they need to figure out what exactly is going on before they can move forward. A big problem with explaining colony collapse disorder is that honeybees are some of the best studied and, at least until the arrival of this strange disease, the best understood insects in the world. 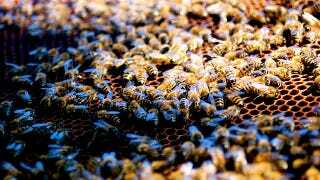 Whatever kicked off this honeybee pandemic of colony collapse in 2006, it seemingly came out of nowhere, which makes it less likely that a fly parasite could wreak so much global chaos. Still, it's conceivable that this is a very recent evolutionary development, and perhaps the constant contact between commercial beehives has transported this fly parasite far and wide, with it only now being identified as a major threat. Even if the Apocephalus borealis parasite isn't the only thing causing colony collapse disorder, it's hopefully a vital clue to solving this perplexing mystery. Via PLoS ONE. Image by Todd Huffman on Flickr.